Although Santa Monica and Ocean Park (South Santa Monica) were both settled at the same time (in the early 1870’s), Ocean Park’s history is somewhat independent from that of the rest of Santa Monica. 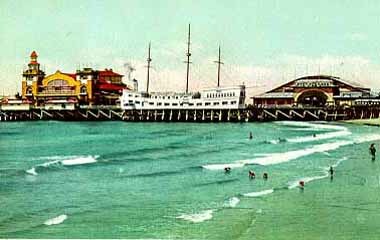 Separated from the north by a gully which today is occupied by the Santa Monica Freeway, Ocean Park was initially oriented towards the beach where a series of piers and other tourist attractions were erected in 1890 to 1910. Much of the housing during this initial period of development was deliberately temporary in nature. Although residential tracts began to be subdivided from the large blocks of land owned by families such as the Lucas’ and the Vawters, construction tended to cluster on streets nearest the ocean, with the 4th Street hill as the inland boundary. 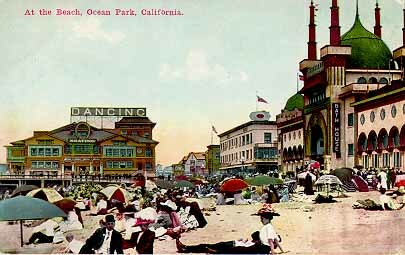 One of the city’s oldest neighborhoods, Ocean Park sprang to life with Abott Kinney’s 1891 Ocean Park Development Company. Kinney bought a sandy strip of land in Santa Monica’s southwestern edge and began building roads, homes, parks and piers. 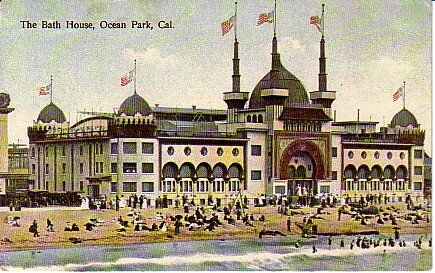 After 1904, Kinney moved his attention to his Venice of America development (also called Ocean Park at the time) , south of the Santa Monica city boundary. The history of Venice and Ocean Park are intertwinned. 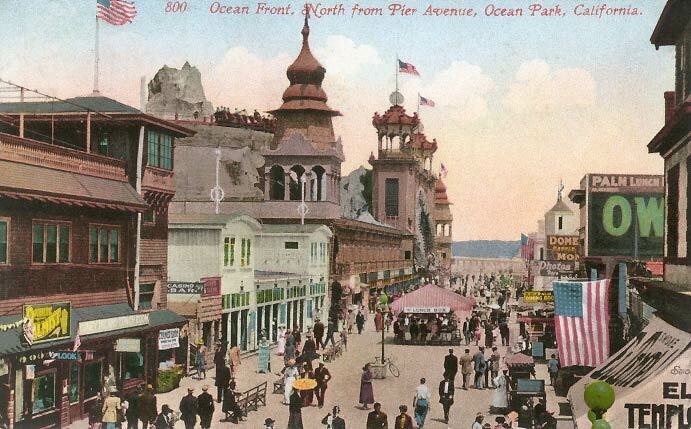 From 1905 to 1925, Ocean Park was developed by people such as Fraser, Merritt Jones, Hart, Hollister and Wadsworth. A long period of decline was interrupted briefly from 1958 to 1967 by Pacific Ocean Park (POP). A large section of the ocean front area was razed as part of the Ocean Park Redevelopment Project of 1964. The Mexican government grants the Machados (Agustín Machado and his brother Ygnacio) and the Talamantes (Felipe Talamantes and his son Tomas) title to Rancho La Ballona. The Machados’ and Talamantes’ claims for Rancho La Ballona are approved in the U.S. District Court. The court settles the ownership claims of 23 individuals; most of who are heirs of the original Machado and Talamantes land grantees. Colonel Robert S. Baker purchases Rancho San Vicente y Santa Monica from the Sepulveda’s and half of Rancho Boca de Santa Monica from the Ysidro Reye’s. He consolidated his Southern California empire when he marries Arcadia Bandini de Stearns, whose deceased husband left her heiress to the largest individual landholdings in California history. Nancy Lucas, a wealthy widow, with three sons, purchases 861 acres from the Machados. This property is east of the ocean and south of Pico.Senator John Percival Jones of Nevada, a Comstock millionaire, buys three quarter interest in Colonel Baker’s ranch. Jones and Baker plan a railroad, a wharf and a town. The town of Santa Monica is founded by Jones and Baker. The town site is fronted on the ocean and was bounded on the northwest by Montana Avenue, on the southeast by Colorado Avenue and on the northeast by 26th Street. The town is about one mile square, laid off in blocks 320×600 feet with a 20 foot alley running the long way. The blocks are subdivided in lots 50×150 feet. The streets and avenues are 80 feet wide, except California and Wilshire Avenues which are 100 feet. The avenues are all named after the States of the Pacific Coast, the streets being simply numbered.Jones builds the Los Angeles and Independence Railroad, which connects Santa Monica and Los Angeles, and a wharf 1740 feet into the Bay. Nancy Lucas sells a 50 acre tract, with 370 feet ocean frontage, to Ivar A. Weid. He at once advertises “South Santa Monica, Lots 60×150 feet. Villa sites purchased by Judges Bicknell and Glassell, Captain Thom, and others”. First Methodist Episcopal Church Building built at the southwest corner of 6th and Arizona. Southern Pacific Railroad completes a rail line from San Francisco to Los Angeles. Under financial pressure, Jones’ LA & I R is sold to Huntington’s Southern Pacific. Southern Pacific inspects the “old-wharf” and advises, due to the condition of the piles, that the wharf be abandoned. After the abandonment of the “old wharf,” Mrs. Lucas and others, hoping to restore Santa Monica to the shipping lists of the Pacific coast, donate 5 acres of land for a new wharf. A large warehouse is built, and Juan Bernard begins construction of a wharf from the foot of Strand street. Intended to be 1500 feet long, it is not completed (Southern Pacific forbade the steamers to land), and the wharf is destroyed in a 1883 storm. Abbot Kinney, a wealthy manufacturer of cigarettes, arrives in San Francisco. The visionary developer will turn South Santa Monica into a beach resort before developing “Venice of America.”The census shows a Santa Monica population of only 417, and this included the entire township of La Ballona (now Ocean Park and Venice). Real estate collapse – the bottom falls out of property values. Mrs. Lucas, who was rather eccentric and lived much of the time alone except for her Chinese cook, dies suddenly under circumstances which gave rise to suspicion and much comment. She was said to have died from the effects of strychnine poisoning, supposedly used for killing rats. The property passed into the hands of her heirs and is soon broken up. Former First Methodist Episcopal Church Building, 2621 2nd Street. Originally built in 1875 at the southwest corner of 6th and Arizona is moved to the southwest corner of 4th and Arizona. W.D. Vawter and with his sons W.S. Vawter & E.J. Vawter purchase 100 acres of the Lucas ranch, lying south of Hollister and east of 2nd.Abbot Kinney and Margaret Dabney Thornton, the daughter of a California Supreme Court justice, are married. Santa Fe Railroad comes to Los Angeles, providing competition for Southern Pacific. Real estate boom 1886 -1887 partly caused by the railway rate war between Santa Fe and Southern Pacific. The City of Santa Monica votes to incorporate. The Boundaries: “From the northern corner of Montana Avenue and Seventeenth Street, east along northerly line of Seventeenth Street to the boundary line between Rancho San Vicente and Rancho La Ballona; thence west to the south line of Santa Monica and Compton Road (now Lincoln Blvd); thence southeast to the south line of Lucas tract; thence to Pacific ocean.”Kinney builds a summer home in Santa Monica. The Vawters sell the Santa Fe tract of 53 acres to R.R. Tanner and T. A. Lewis, who put down a well, subdivide into lots, and put in sidewalks. Houses are built on the tract by R.R.Tanner, T.A. Lewis, W.S. Vawter and others. Jones gets the Old Soldiers Home for Los Angeles, which leads to the development of the new town of Barrett (changed to Sawtelle in 1899).Frederick Hastings Rindge, a thirty year old millionaire, arrives in Los Angeles. His wife / daughter’s name, Rhoda, spelled backwards becomes Adohr Milk Farms. The Wave Crest tract (4th St-Pico-Lincoln-Bay) with 90 lots is put on sale. H.L. Jones subdivides the Ocean Spray tract into 120 lots.The Arcadia tract, Ocean View tract, Commercial Company’s tract and others are opened up during this period and a large number of improvements are made. G. S. Van Every and T.A. Lewis, made an application for a franchise (Santa Monica Wharf Company) to build a wharf at the foot of Bicknell avenue (at Front street). Real estate market crash – the land boom of the 1880’s collapses. The Ostrich Farm (1889-1895) is established at South Santa Monica. A tract of seven acres, known as the Santa Monica Tract () is fenced in with 34 birds. Kinney is one of the organizers of the Santa Monica Improvement Company which built the Casino on North 3rd St. and laid out the grounds and tennis courts. This was the forerunner of “Country Clubs” and was for years the center of tennis interests in Southern California. Moses Hostetter an Iowa farmer moves to Santa Monica.Kinney and (silent partner) Francis G. Ryan purchase controlling interest in Pacific Ocean Casino, a restaurant and tennis club. In September, Kinney & Ryan purchase a 1-1/2 mile long, a narrow strip of sand dunes along the shore line south of Santa Monica extending from Strand Street to Brooks Avenue, 275 acre tract of partially marshy beach front land from Captain Hutchinson. At this time investors in beach properties favored bluffs, but Kinney & Ryan believed that the time would come when the sand close to the ocean would be eagerly sought after. The property is bought with a long view to the future, and it is decided not to put any of it on the market. To encourage building, water was brought in, the tract was sewered, board walks laid, and lots leased to persons desiring to put up small cottages. Kinney & Ryan (Ocean Park Development Company) build a pier, golf course, horse-racing track, boardwalk and other resort amenities on the northernmost edge of their holdings. Kinney gives 12 acres to the Santa Fe Railroad so they would extend their Inglewood line north to his resort. Santa Fe Railroad passenger Ocean Park depot built near the ostrich farm at Hill and Main Streets.George Kintz builds the Crystal Springs Bathhouse and Plunge (the first South Santa Monica beach attraction) at the end of Pico Blvd. Southern Pacific builds the Long Wharf two miles north of Santa Monica. Kinney and Ryan begin selling small 25 x 100 foot beach lots priced at $100 and featured piped water at their Santa Monica tract in March. Tents are erected on unsold lots and are available to campers for summer rental.Frederick Rindge, who is president of the Los Angeles YMCA, founds a YMCA summer camp on 5 acres of land located on 250ft beach front near Hill St., donated by Kinney who hopes that the YMCA camp will attract people to his beach resort. Moses Hostetter buys seven lots in Ocean Park. Those lots are now 2601 Second St. and 2628 Second St.; and 236 Beach St. and 2547 Second St. and 237 Beach St. and 242 Beach St.and 2623 Third St..
Moses Hostetter choses to live next door to his son, William (237 Beach St.), and constructs the Victorian at 2601 Second St.. The house at 237 Beach St. is the oldest original structure in the Third Street Historic district, dating from around 1880. Roy Jones House, 2620 Main Street. The American Colonial Revival style home of Roy Jones, son of Senator John P. Jones, is built at 1007 Ocean Avenue. The house was moved to its present Heritage Square Museum location in 1977. The small community is renamed Ocean Park in May by Kinney.Sante Fe builds a 500 foot long pier just south of Hill Street.The resort in March consists of 150 beach cottages, and a small commercial district along Pier Avenue. A building boom added 40 new beach cottages, several stores, and Kinney’s new 40 acre Ocean Park race course and golf links. Moses Sherman’s Pasadena and Pacific Railroad builds an electric line to Santa Monica. A spur is extended south to Hill St.The first electric car (Los Angeles and Pacific loop line) makes its initial trip through South Santa Monica. The car left the corner of Ocean and Santa Monica Avenues and, after crossing the bridge, ran down Main Street to Hill Street, thence eastward to Fourth and returned to Ocean Avenue.This year Santa Monica began to talk seriously of the sewage problem and proposed to locate it’s outfall at a point south of the city limits. From this time on date the sewer troubles of the beach. H.L. Jones revives his Ocean Spray tract which had been first exploited in 1887 and sells 88 lots. The YMCA auditorium, erected in 1893, burns. The loss was complete as there was no water to save the property.In May the new City Water Company turned the water into a mile and a half of mains, the water coming from two wells and being stored in a 50,000 gallon tank.The electric light system is also extended to Ocean Park this year and adds to the metropolitan claims of the new resort. Many new buildings, including several stores, a 10 room house by Mrs. Bernard, and forty or more beach cottages are added this year. The South Santa Monica Municipal League was organized to “promote all measures that will benefit the city; to encourage all improvements, both public and private, to oppose saloons and disreputable places in South Santa Monica”. The resort consists of 150 beach cottages, and a small commercial district along Pier Avenue. A building boom added 40 new beach cottages, several stores, and Kinney’s new 40 acre Ocean Park race course and golf links. Kinney and Ryan build a 1250 foot long pier at Pier Avenue over the 1895 existing pilings of Santa Monica’s outfall sewer pipes. Francis Ryan’s widow (Matilda Brooks) marries Thomas Dudley a Santa Monica businessman who becomes Kinney’s new partner. E. J. Vawter (Ocean Park Floral Company) devotes 15 acres of land (the ‘Carnation Tract’ between Rose and Sunset Avenues, 2nd and 4th Streets) to the culture of flowers, mostly carnations. The Alvin Archer builds his American Colonial Revival house 245 Hill Street. The Ocean Park post office opens with L. B. Osborne as postmaster and the office was located in his grocery store on 2nd street. The Methodist church (organized as the South Santa Monica Methodist-Episcopal church) began holding services in the Santa Fe depot. The Gothic Revival style church ,donated to them by the North Side church , was moved from 4th and Arizona to Hill and 2nd 2621 Second St). The Santa Fe Company orders its tenants, who had erected cottages on leased lots, to vacate at once; the unfortunate cottage owners had to hustle to find new locations for their buildings. The Santa Fe Company leveled the ground and made some improvements. In August it is announced that the entire South Santa Monica holdings of the Santa Fe Company has been purchased by G.A. Hart and A.R. Fraser, of Los Angeles, and named Central Beach tract, and immediately began grading and putting streets through it. The first street opened through and paved between the beach and the railroad tracks was India St (now Hill St). Building restrictions were put on the property, which included 185 lots 25 by 100 feet in size, extending from Hart Avenue on the north to Grand (now ?) on the south and between the beach and the railway tracks (now Nielson Main ?). 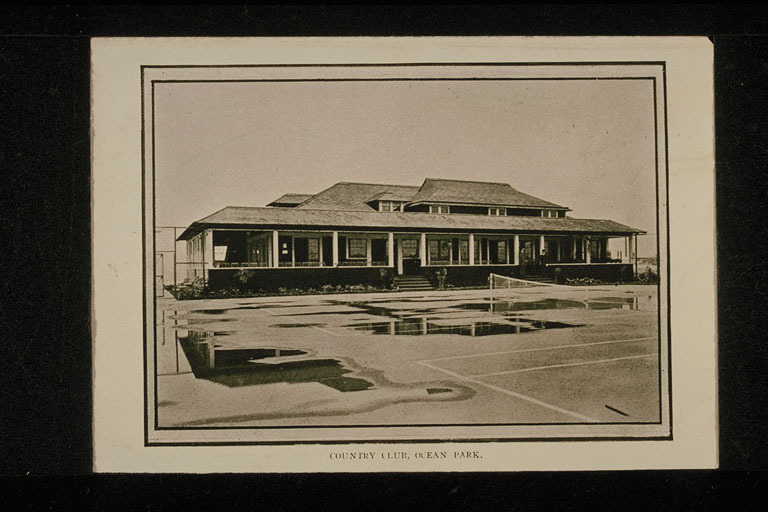 Kinney & Dudley build the Club House for the Ocean Park Country Club (Club House-Main-Westminster-Pacific).Ocean Park is a village of 200 cottages with a post office, stores, a pleasure pier, an auditorium, a race track and a casino. The development of Ocean Park coincided with a major influx of newcomers from the midwestern states and, at the same time, a boom in home construction. Among those locating here were G.A. Hart, A.R. Fraser, R.B. Stevens, W.D. Winston, J.R. Newberry, A. Lichtenberger, William Hammel, and other business men of Los Angeles, many of whom built permanent houses here. 2619 3rd Street “Swiss chalet” Craftsman bungalow built by N. Lawrence for John Argyle. Thomas Dudley sells his half interest in the Ocean Park Improvement Company to Alexander Fraser, Henry Gage and George Merritt Jones. This included the beach property from Frazer St to Horizon Ave. It was announced that no more lots would be leased and that leasers would be given until May 1st, to purchase their lots or vacate. Hereafter lots would only be sold with building restrictions which would put an end to the building of cheap “beach cottages.” Many of the lease holders purchased their lots and removed the old buildings to put up modern cottages. To many, however, the prices charged for lots and the building restrictions seemed prohibitive and the cottages were removed to cheaper property. During 1902-03, it was a common sight to find a cottage on wheels moving back from the ocean front to the hills. “There are seven hundred cottages at Ocean Park. They are all tasteful and many of them are pretentious. Ocean Park is not a place with a stiff, ceremonious air. There is a hospitable individuality, a generous atmosphere, in their architecture that shows as much as anything else that the good people of Ocean Park are not divided into social cliques or factions.” June 12th, the Los Angeles Saturday Post. With the completion of the Los Angeles Pacific’s electric trolley line in October hundreds began visiting the resort. Santa Fe Railway abandons its line from Inglewood into Santa Monica, on the grounds that it is operating the line at a loss. To assure electric trolley service to Ocean Park from downtown Los Angeles, Kinney forms a partnership with William Spencer Hook, the owner of the rival Los Angeles Traction Company. Although construction of the new line is started, Hook sold out to railroad interests who didn’t want competition. William Martin, owner of the Martin block, on the corner of Ashland and Main, gives the use of a part of a lot for a fire house and the board of city trustees provided the lumber for a small building, and bought a fire bell. The Washington school house is built on the corner of Ashland and 4th. The Ocean Park Villa Tract (4th-Indiana-Lincoln-Westminster) opposite the Country Club is sold in half acre lots which are quickly subdivided and a new residence district grows up. In September, Ocean Park Villa Tract No. 2, 60 acres (Abbot Kinney-Westminster-Lincoln-?) is sold. E. J. Vawter sells 60 lots on the hill in the vicinity of Hill and 4th. The citizens of the southern end of Santa Monica felt that they had not received due consideration from the town trustees and that they had no representative on the board. There had long been a rivalry in growth, street improvements and attractions. A committee consisting of Col. A.B. Hotchkiss, a long-time resident of the South Side, Joseph Bontty and Captain Malim, were active in urging this action, stating that the new town would remain a town, governed by the Board of Supervisors, and would save the expenses of a city government while improving her own streets and providing her own water, and light supply. The question is submitted to a vote, and shows a very decided majority (400 to 59), against the legal partition of the town.Kinney’s partners build a Casino containing a restaurant and vaudeville theater beside the Ocean Park Pier.Kinney and his partners (Fraser, Gage and Merritt Jones) begin to disagree on the development of the marshy undeveloped southern portion of their property. Fraser and Merritt Jones sell the old Santa Fe right of way to Sherman and Clark of the Los Angeles and Pacific. Kinney and his partners (Fraser, Gage and Merritt Jones) meet in January to dissolve their Ocean Park Development Company partnership. Kinney wins the coin toss and chooses to own the undeveloped marshy property at the south, and forms the Abbot Kinney Company. Voters residing in the unincorporated section of the Ocean Park Development land, south of Marine Avenue, vote to establish the City of Ocean Park. 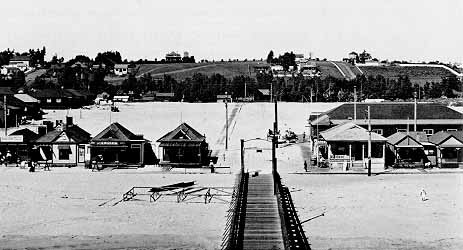 The new town begins its existence and the name “Ocean Park” became the property of a district which had been in existence less than eighteen months, leaving the post office of “Ocean Park” within the bounds of Santa Monica, and creating confusion as to the meaning of “Ocean Park” (until 1911, when Ocean Park is renamed Venice). Although wealthy men, Kinney’s old partners Fraser and Merritt Jones are resentful of Kinney, and their political forces control the City of Ocean Park from 1904 until 1908, when Kinney’s “Good Government League” slate took over. Fraser and Merritt Jones hold sway over the Board of Trustees during the developmental years of the city and take every available opportunity to thwart their former partner’s plans. The Los Angeles and Pacific Railroad completes its Short Line electric trolley line (along Venice Blvd) to Venice Beach in September. The Abbot Kinney pier is built at Windward. Kinney, unsatisfied with progress on the canals, in November hires a steam dredge to complete 2 miles of waterways. 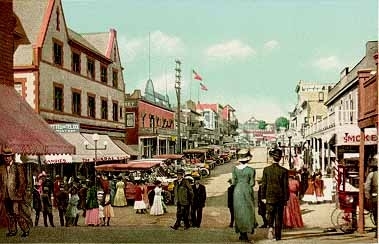 The southern part of Santa Monica, commonly known as “Ocean Park,” which was already an important business center as well as a popular summer resort, with the completion of the bath house and the Decatur Hotel, the building of the Masonic block and many other business blocks on Pier Avenue, Marine street and the ocean front began to put on a metropolitan aspect; while the creation of Venice-the “Dream City” of Kinney’s fancy, made the new town of Ocean Park (Venice) the center of attraction for the entire state. Winter storms in February and March demolish the entire Abbot Kinney Pier. Venice of America’s grand opening is rescheduled for the July 4th weekend. With only a few hotels open, many tourists stayed at Kinney’s Tent City alongside the Grand Canal.Ocean Park dedicates its enormous indoor heated salt- water plunge also on the July 4th weekend. Looking more like a movie set, the Ocean Park Bath House was one of the most talked about buildings of its day-and a great draw for the beach area. The lavish indoor plunge (heated for those who didn’t take to cooler ocean swimming) was built by A.R. Fraser. The bath house is shown here just before completion in 1905. The White Star pier is completed at the foot of Hollister. A good band is installed and a number of “amusements” provided, but there are now so many rival attractions that it was not a paying investment during its first season and is sold in 1906. Renamed the Bristol pier in 1908, and the Crystal Pier in 1919 by Nat Goodwin, it is finally razed in 1949. 2617 3rd Street built for John Blanchard. Ocean Park built a 6000 seat auditorium adjacent to its Ocean Park Pier. A skating rink occupies a portion of the immense building. In January the Ocean Park post office is moved from Pier Ave to the new three-story brick Masonic building on Marine Ave. In December C. E. Lovelace, editor of the Ocean Park Journal, is appointed as postmaster for Ocean Park in place of Meigs, the incumbent.Edward H. Harriman, who owns both the Southern Pacific Railroad and the Los Angles Pacific trolleys, gives Kinney an ultimatum to sell Venice of America. Kinney reaches an agreement with the railroad baron that would allow him to develop the ocean front as a harbor. Fortunately Harriman loses interest. 2628 3rd Street built by H.L. Smith. Kinney and the town’s Trustees are embattled in a power struggle over control of Venice of America. When the Trustees banned Sunday dancing and rescinded Kinney’s liquor licenses, he closed down operations to deprive the city of most of its tax revenue. The Trustees yield. 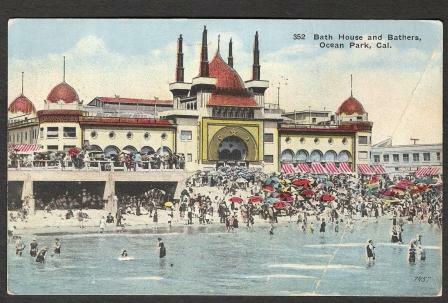 When Kinney decides to build a new ocean front bathhouse and plunge near his pier, several of the Trustees who owned the Ocean Park Pier refused to issue a building permit. Kinney doesn’t wait and pours the concrete foundations. When the sheriff decided to dynamite the foundations in June, the woman’s Pick and Shovel Club hold a picnic on its walls. The sheriff gives up and Kinney finishes construction and his open-air pool opened in August. Kinney loses the dis-incorporation election on September 30th. Venice of America remains part of Ocean Park. In September, Kinney loses the dis-incorporation election, and Ocean Park decides to “dis-incorporate”. The town is partly absorbed by Santa Monica, and partly by Venice. Venice of America remains part of Ocean Park. Part of the Ocean Park Pier remains in Santa Monica. Kinney gets his revenge when his Good Government League slate of candidates for Trustees defeats his entrenched enemies, and remains in control until the early 1920’s. Although Kinney’s supporters are clearly dominant, they are unable to muster a 2/3 majority to dis-incorporate from Ocean Park. Fire fighters saved the Abbot Kinney Pier when a fire broke in October. Fire house on corner of Mills and 2nd is built. Pier St (looking inland)Vawter House, 504 Pier Ave. A blue shingled house built by E. J. Vawter. Charles Warren Brown House, 2504 Third St. Charles Warren Brown architect. Owner-builder Brown is active in civic affairs and briefly served as a Councilman, which furthered his success as a speculative buyer and builder. 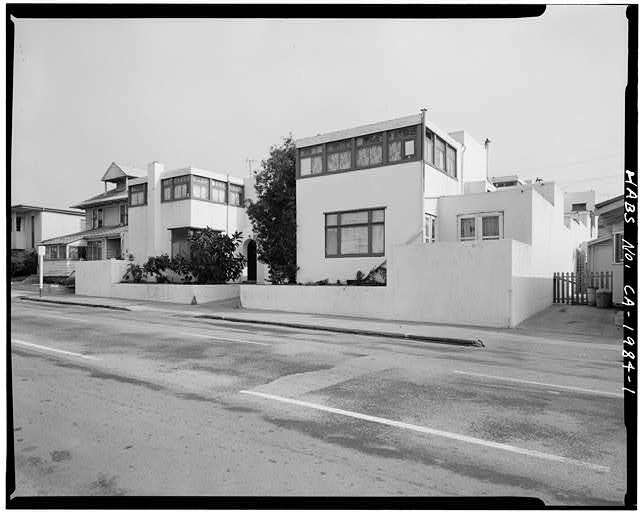 John W. and Anna George House, 2424 Fourth Street Craftsman bungalow (designated Santa Monica Landmark). http://www.smpl.org/archive/3942/IMG0054.JPG2650 2nd Street built.2704 3rd Street built. 240,242 & 244 Hill Street built. Kinney’s 46 years old wife Margaret dies. 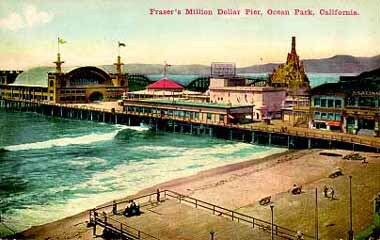 Fraser’s Million Dollar Pier located between Pier and Marine Avenues opens. It incorporates the existing Horseshoe Pier, and at 1250 feet long and 300 feet wide it is the largest amusement pier in the world. The name of the City of “Ocean Park” is changed to “Venice” thus ending the confusion between the two Ocean Parks. Eddie Maier (local brewery owner) and his contractor partner, Augustus Stuzer begin to build a new amusement pier at Center Street, five blocks south of the Abbot Kinney Pier. The project was not completed following a dispute between the partners. Kinney deeds the Venice of America canals to the town of Venice, with a deed restriction that states the canals would remain canals, or the property would revert back to the Abbot Kinney Company. 2544 3rd Street an airplane style Craftsman bungalow, the home of a local Main Street butcher, is built. 2612 3rd Street A cross-over Victorian/Craftsman with an eyebrow balcony, was built by J.L. Packard, the tobacconist on Main Street. 2614 2nd Street Craftsman bungalow built by W.J. Edinger for J.L. Van Every. Fraser wins law suit against Santa Monica (they owned 42 foot of ocean frontage at the foot of the pier) and completes the re-building of his fire proof pier. Ernest Pickering of the State Amusement Company signs a long term lease to operate the pier’s amusements. Fraser Pier’s and Ocean Park Plunge (right). 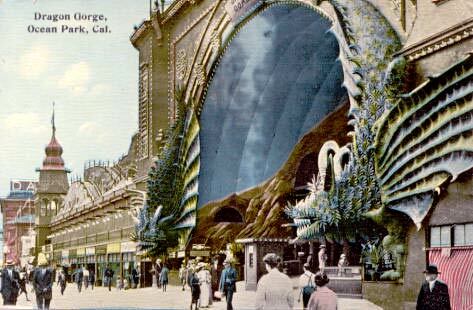 The Dragon Gorge, the large ornate structure with the towers, was an early roller coaster – Ocean Front Walk at the Fraser Pier. Kinney (16 Park Ave) marries his mistress Winifred Harwell (133 Bay St)Iglesia El Sermon de Monte, Assembly of God Church 2701 Second Street, originally the First Baptist Church, is built. Ocean Park Pier burns. Venice ‘s Board of Trustees, authorize the Venice Grand Prix on a triangle course down Electric Avenue, Rose Avenue, and Compton Road (Lincoln Boulevard). Electric tram service on Ocean Front Walk between Venice and Ocean Park begins operation. US enters World War IEnterprise Fish Company, 174 Kinney St was a transfer station for the narrow-gauge Red Car line.Ocean Park Library, 2601 Main Street by architects Kegley & Gerity is the last Carnegie Library remaining in Santa Monica. The library site is donated by the Charles A. Tegner family where the original Tegner home once stood, and the building for library is a gift of the Carnegie Foundation. The architecture is a simplified variation of Classical Revival design. The original facade was retained during a major remodel and expansion in 1985. When Santa Monica votes in December 1918 for Prohibition of alcoholic beverages, the Santa Monica pier required no changes since drinking and gambling were never allowed. In fact, the Looff Pier was a resort of character and refinement lacking the “honky-tonk’ ribaldry that characterized many other sea side resorts. Enerest / Earnst Pickering purchases the Fraser pier. Irving Gill’s Horatio West Court, 140 Hollister Avenue, four two-story all-concrete apartment buildings built. The Pickering Pier is expanded to double the size.Abbot Kinney dies. His eldest son, Thornton, takes over the business.A fire destroys the Abbot Kinney pier. Thornton Kinney announced, after the disastrous fire that completely destroyed the old Abbot Kinney Pier, that a new amusement pier would be rebuilt. Center Street Pier. The Sunset Pier, several blocks south of Windward Avenue was under construction within days of the disaster. The pier featuring the Sunset Ballroom and little else opened in July. Plans for completing the horseshoe pier never materialized.Donald W. Douglas founds the Douglas Aircraft Company and builds a plant at Clover Field. Charles Lick, Austin McFadden and George Leihy construct a new pier 800 feet long and 225 feet wide at the foot of Navy Street adjoining the south side of the Pickering Pier, but physically on the Venice side of the town line. In February, Venice voters reject a proposal to be annexed to Santa Monica. In July, Venice voters reject a proposal to be annexed to Los Angeles. Pickering and Lick piers burn. Lick (on the Venice side of the property), began rebuilding immediately. The Venice Investment Company and West Coast Theaters acquires Pickering’s beach property but don’t rebuild.E. Maier & . Stutzer build Sunset Pier at Center Street. Venice votes to be annexed to the City of Los Angeles. Los Angeles Sunday Blue Laws immediately become effective – Sunday dancing and gambling games are banned. Business suffers on both the Venice Pier and Lick Piers as Sunday customers instead go to the Ocean Park Pier in nearby Santa Monica. Los Angeles votes for an ordinance establishing a special amusement zone, and Venice’s dance halls re-open for business. The Venice of America canals are filled by the City of Los Angeles. The City of Los Angeles takes possession of the bankrupt Sunset Pier.Oil is discovered on County property east of Grand Canal and Ave 35. Spending money became scarce once the Depression began in the 1930’s. The Abbot Kinney Company defaults on bond interest payments.1932 Olympics. Long Beach earthquake. Venice’s high school is damaged, but only a few other Venice buildings are damaged. Looking north from point 300 feet south of Bicknell Avenue, along the route of the proposed “Ocean Front Walk” location of State Route 163 between Santa Monica and Redondo, showing extent of erosion between Pico Boulevard and the Crystal Pier. Once World War II began on December 7, 1941 a blackout immediately took effect. Douglas Aircraft’s factory in Santa Monica (Ocean Park & ??) was completely camouflaged so that it looked like a suburban housing tract from the air. A fake aircraft factory was built across the street. The Abbot Kinney Company’s 25 year tidelands lease for their pier expires. The City of Los Angeles Parks and Recreation Department refuses to renew the lease – because it interferes with their master plan of widening the beach and removing all man made piers. Venice (Kinney) Pier closes. A new Santa Monica City Charter was adopted with a Council-Manager form of government, with seven Councilmembers. The Kinney Company’s Venice Pier beach property is sold to the State of California. The Lawrence Welk Band is hired to revive the failing dance business on the Lick Pier. Construction of the huge Marina del Rey small boat harbor begins. A channel entrance for the harbor is cut at Avenue 58 on the Venice Peninsula. CBS and the Los Angeles Turf Club decide to convert the decaying Ocean Park Pier into a new sea themed park and compete with the newly opened Disneyland in Anaheim. They close the park after Labor Day 1957 and hired the best amusement park designers and Hollywood special effects artists to transform the park.Santa Monica Redevelopment Agency established. Work begins on the Ocean Park Redevelopment Project. All buildings along the beach west of Main Street from Ocean Park Blvd. south to the Venice boundary are demolished. Two 17-story apartment buildings (Santa Monica Shores) and an adjoining golf course replaced Ocean Park’s historic business district. The 1200 foot long concrete Venice Fishing Pier opened at Washington Street. The Santa Monica Freeway opens to traffic. Pacific Ocean Park (POP) forced into bankruptcy and closes. The Douglas Corporation close their Santa Monica plant. The abandoned POP piers burns. The remains of the Pacific Ocean Park pier demolished.